Climate models must take this carbon sink into account. The impact on levels of carbon dioxide in the Earth’s atmosphere by the decaying remains of a group of marine creatures that includes starfish and sea urchin has been significantly underestimated, conclude scientists. “Climate models must take this carbon sink into account,” says Mario Lebrato, lead author of the study. The work was done when he was at the National Oceanography Centre, Southampton (NOCS) and affiliated with the University of Southampton’s School of Ocean and Earth Science (SOES); he is now at the Leibniz Institute of Marine Science in Germany. Globally, the seabed habitats occupy more than 300 million million square metres, from the intertidal flats and pools to the mightiest deep-sea trenches at 11,000 metres. 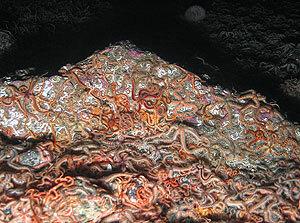 The benthos – the animals living on and in the sediments – populate this vast ecosystem. This is less than the total biological production in the main water column, or pelagic zone, which scientists believe to be between around 0.6 and 1.8 gigatonnes of carbon per year. But echinoderms apparently deliver more carbon to the sediments than do forams, for example. These microscopic animals live in vast numbers in the oceans and are traditionally regarded along with coccolithophores (single-celled marine plants surrounded by calcium carbonate plates) as one of the biggest contributors to the flux of calcium carbonate from the sunlit surface waters to the ocean’s interior – the so-called ‘biological carbon pump’. The authors are: Mario Lebrato (NOCS/SOES), Debora Iglesias-Rodríguez (NOCS/SOES), Richard Feely (Pacific Marine Environmental Laboratory/National Oceanic and Atmospheric Administration, Seattle), Dana Greeley (NOCS/SOES), Daniel Jones (NOCS), Nadia Suarez-Bosche (NOCS/SOES), Richard Lampitt (NOCS), Joan Cartes (Institut de Ciències del Mar de Barcelona), Darryl Green (NOCS) and Belinda Alker (NOCS).